Few might expect a bus operator to be a Steve Irwin Award-winning pro-environmental business, but that is just one of many talents the Fun Over 50 team exudes. And its latest Diamond Class Irizar i6 coach on Volvo B11R chassis is a brilliantly exuberant illustration of what a shining beacon this company is for the industry. FUN OVER 50 – an unusual name for a travel company to some, but Springwood, Queensland-based owners Rob Archibald and Toni Brennan knew exactly what they were doing when offering amazing V.I.P coach experiences and sustainable tours to that discerning target market. Tours ensuring passengers are having adventures with likeminded, active peers and experiencing the very best Australia has to offer. And they deliver experiences well outside the box of what you might expect, enhanced by the recent acquisition of a very spacious and 'sparkly' Irizar i6 to their fleet. 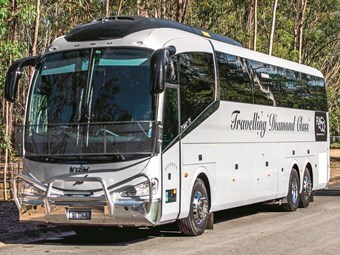 With this being the fourth Irizar purchased – the others making up Fun Over 50's (FOF) prestigious Gold Class of coaches – Archibald was quick to point out why they've stuck by the Spanish brand. "About nine years ago I was talking with one of the operators from Pegasus Coaches in Sydney. I was looking to buy a coach, but couldn’t afford a new one at the time. We had a look at different second-hand ones, but that option we were a bit wary of. We decided to go on our knees to the bank and see what we could come up with. Pegasus told us Irizar and Scania were doing some great deals with some of the European chassis manufacturers, making it very affordable for companies like ours, so that’s what initially got us in to the Irizars," he explained. "How we package our products, they pretty much do the same thing and that makes it pretty easy for you. The Irizars are big in Europe and I did my homework about them; the price was affordable and [it] didn’t look like the normal run-of-the-mill coaches. Irizar has always had good back-up and that was a big thing for us. I also approached Sid Fogg’s and he also had good accolades for them," Archibald said. "I went to a few of the bus and coach shows and credit to all the coach builders – there are some great coaches out there – but we couldn’t get past the good looks of the Irizar. It just has nice lines with the bull nose that tapers off," he added. So what kind of paint was used to get that sparkling, diamond effect? Er … none! "Toni had come up with a concept to have the coach finished in a diamond-look finish for our 'Diamond Class Tours'. We went to quite a few paint places, but to get that effect would cost a fortune because of the size of the vehicle – plus it would be hard to get the glitter consistency we wanted," Archibald explained. "Toni had, funnily enough, found the colour she was searching for on a nail chip at a beauty salon – Lexus Gold 82 – so she took the chip to Irizar." This began a time-consuming process to achieve Toni’s vision for the new coach. "We thought it just wasn’t going to happen but Irizar suggested that we go for a wrap – a totally new thing for luxury coaches. We went to Melbourne and met three different companies Irizar had suggested. The company we chose do great work – Exotic Graphix in Carrum Downs. I was impressed from the moment I walked into the office. There were lots of recommendations on the wall and I could see that they do the police cars. They told us they had done normal buses, but nothing like what we wanted – there was a lot of things to consider because of reflectiveness and keeping within the laws. When the sun hits it looks amazing!" he explained. As Archibald explains: "The body was made in Brazil. The chassis leaves Volvo in Sweden as a shortened version and it goes to the factory in Brazil were it gets cuts and lengthened to the customer's specs – in this case 13.5 metres – then they put the body on. After that it comes to Australia with a body as a shell with just the overheads and flooring but no seats". "When it arrived here Styleride did the leather seating. We had spoken with them at a bus show in Sydney and told them what we wanted. We were restricted in seat size by the ADRs (Australian Design Regulations); we could only go 50mm wider and you are restricted by the recline. In other countries they don’t have the same safety restrictions. We did the best we could within the regulations. We wanted a seat that was a similar experience to sitting in business class on a plane and I think we have achieved that. We have arm rests on both sides for extra comfort and incredible legroom." "We are impressed with the Volvo, but we got it by default. We were going for a Scania, but they had a delay getting the chassis to Brazil to get the coach delivered on time. Full credit to Scania, though; they did everything they could worldwide to meet our specs. "Daniel Castro from Irizar said he had two Volvos ready to go in Brazil. I’d never had a Volvo, but the I-Shift is great with 450 horses. I like to have more power than we need because of the terrain we travel in. It's early days, but I have been very impressed so far," Archibald said. "On all coaches we always take out a top-of-the-range, preventative service that covers everything, so we don’t need a mechanic! Volvo does have longer servicing intervals, so when I asked about it they said have confidence in the quality of their products to go the distance," he concluded. She's impressive from the start; the bodywork is stunning put in the daylight – certainly not your standard finish for a coach. With only 26 passenger seats the spaciousness is obvious once on board. The flat timber floor and 'diamond'-embroidered, plush black leather seats certainly lets you know you are in for one luxurious ride. There's even a kitchen equipped with a microwave and a fridge filled with snacks – love it! The personal audio-control unit has channel options, a USB charging port, Wi-Fi and stereo headphones on each seat, so technology is at your fingertips. The pull-down blinds are sleek and do not totally block your vision or that of other passengers; this helps keep with the overall glamorous look. His and hers toilets are sure to please fussy travellers, while the windows are all double glazed, so temperature and noise levels inside are superb. The leather air-operated driver's seat was more than comfortable and the driver-accessible outside window is electric – much easier than manually operating ones. There is a driver's bed that is also handy as a back-up if a passenger becomes ill.
Leaving FOF HQ at Burbank we travel along the Gateway Motorway towards Brisbane to get a feel for how touring in this coach might be. This one has the bigger 450hp and 2200Nm powerplant matched with the Volvo I-Shift 12-speed automatic transmission. This combo certainly is impressively powerful and one of the fastest off the mark. It was chosen as the tours often take the coach into tougher outback conditions. The Volvo electronically controlled disc brakes are faultless; we did a few hard brakes and they were nice and flat, very predictable. Through some tight bends around Brisbane Koala Bushland Park, the steerable axle tag is magic – don’t forget this is a 13.5m coach! All in all a great all 'round coach, impressive visually and internally and certainly this Irizar was a pleasure to drive. No mechanical or driver-experience negatives could be found. It's a combination of a good-priced product that delivered on looks and servicing with good referrals within the industry that made FOF initially choose the Irizar B11R as its Diamond Tina. In 2016 FOF won the prestigious Steve Irwin award for eco tourism, achieving climate action leader status which only 12 companies within Australia have achieved. FOF is a unique coach company whose tours are tailored to different 'fitness levels' for customers, as well as has 'hidden secret' extra VIP surprises for them. As the business grew people, FOF contacted third-party operators as it FOF didn't even have a bus at this stage, but it found the quality from these operators just wasn't there. "We just found it very hard to rely on the quality of coaches and drivers to represent our brand. I was very focused on being elegant and providing quality service. To me presentation is everything, I knew what I expected and I wasn’t getting it," she said. Brennan says FOF is different because, "We care. We offer all-inclusive tours – tell us what you want and we do the rest. A lot of companies over promise and under deliver; our recipe for success is to have a few hidden secrets – free welcome drinks, a surprise comedy show – so you get more than you expected!" "We sponsor the Man from Snowy River Bush Festival, which attracts 5000-7000 people, and we have exclusive use of a marquee, so our travellers feel very special. "At Opera in the Vineyard at Bulladeen and the Elvis festival, we have the very front row [for our guests]. We do pay extra for that privilege but the difference goes to charity. It's all those things that we deliver but don’t advertise that makes all the difference." "We also have a programme called Our People Our Planet, where we donate $10 from every passenger into a green bank. Every time we travel to a region we donate to conservation projects within the region like the Royal Flying Doctor service and the Great Barrier Reef. "We have tours were we do plantings, rejuvenation and conservation work - everyone gets a T-shirt and cap with a "Being Seen Being Green" logo on it and gets really involved. MISC: Leather air-operated seat and electric window, a bed!